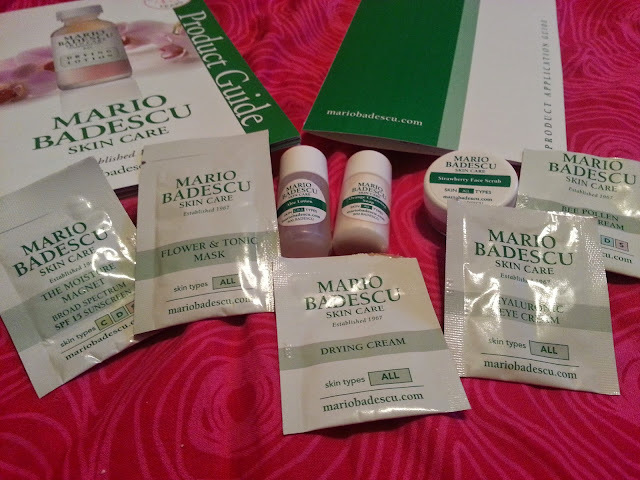 I actually saw in the beginning of the year that if you did a skin analysis on Mario Badescu's website, they would send you an email that gave you the option of receiving the picks, as samples. I applied back then, and never ever got them. Fast forward 8 months, and they were still offering the same thing. I applied with a new email to see if it would work, and I got a confirmation email. About a month later my samples finally arrived. I've been playing around with them for a month, so here are my thoughts in what was sent for me. What I really liked was that they sent a pamphlet outlining what they sent me, how often each product should be used and in what order they should be used. Here's a break down of what I was sent, and what I thought about it! I didn't find anything spectacular about this cleanser. It didn't foam as much as I thought. I was a little sceptical because its soap, and I have dry skin. Why it would recommend soap, which is drying, I will never understand. Anyway, it didn't smell strong, or like oranges. I probably wouldn't purchase this as I know something similar could be found in any store. This is actually made of strawberries. Its pink, its creamy, and has little strawberry seeds as the exfoliant. I liked how creamy it was, but as a scrub its not the greatest. The seeds don't spread evenly. I prefer my St.Ives scrub, plus its probably a lot cheaper than the strawberry scrub. I didn't find anything special about this eye cream. In fact, I actually like the Yalmeh Eye Cream I was sent from Tomoson, more than this one. It doesn't do much for me, for moisturizing or reducing my dark under eye circles. I wouldn't purchase this. I applied this with a little water. It was actually clay, once it hardened it felt stiff on my face. The smell was okay. I probably wouldn't repurchase this, but it wasn't bad. I liked it a little more than my acai mask that I have though. Eh. This is just your typical toner. I've been using it because it's convenient to use, especially if I'm away from home. The soap and toner are easy to throw in a bag. The toner is gentle and doesn't sting when I use it. I probably wouldn't purchase it though because I have so many other brands in rotation. I usually use night cream as a day cream because my skin is so dry and I find day creams just don't moisturize my skin enough. This was no different. It was a little thicker for a day cream, but my skin just continued to feel dry. I wouldn't purchase this. According to the email I was supposed to get drying lotion and drying cream. I've heard amazing things about the drying lotion so I wanted to try it. But, I guess because its in a glass vial they never sent it. It's supposed to dry out acne breakouts and does a good job doing it. So I was majorly disappointed when I didn't get it. The drying cream I did try and I hated it. Its coloured like a concealer, but too dark for my skin. It also has a gross smell to it. I definitely would not purchase it. I really wish I got to try the drying lotion though. So this was the one sample I really really loved. It's somewhat waxy but thick. As soon as I applied it to my face, it felt moisturized. It cleared up some dry patches that I had as well. Whenever my skin feels extra dry, I will apply it and immediately I feel relief. I haven't tried it under makeup yet, but it doesn't seem to pill on just my skin, which has been good. Unlike the Garnier, Shiseido and Live Clean I've been rotating. I will have to give it a chance with makeup over top. I actually purchased this (and the drying lotion I've been wanting to try) today because they sent me a $10 gift card for my birthday, and there was a 10% off promo. I think everyone should try this out. And get some free samples. You may get something you really like! I would have never tried most of these products, and I'm glad I got a chance to! Ipsy - December 2014 - Sneak Peeks! Ipsy: My Year Review - And All Time Favourites!